Cattlemen caught in a devastating cost-price squeeze are now taking a serious second look at the old Texas Longhorn. Doubly stunned by the inflation of all cost factors and the recession of cattle prices, cattlemen are actively seeking new "profit genes" for their beef herds. The quest has broadened to an international search for "new" genes that might boost productivity and profits. In this process, many have tended to overlook a promising gene source close to home. I refer to the Texas Longhorn. An almost forgotten reservoir of unique genetic material, the Longhorn is literally an old source of new genes! In fact, the Texas Longhorn may prove to be a real "genetic gold-mine" in the future of our beef industry. What is so unique about the Texas Longhorn? What makes it different from the multitude of other breeds now available in North America? Simply this: The Texas Longhorn was fashioned entirely by nature right here in North America. Stemming from ancestors that were the first cattle to set foot on American soil almost 500 years ago, it became the sound end product of "survival of the fittest". Shaped by a combination of natural selection and adaptation to the environment, the Texas Longhorn is the only cattle breed in America which - without aid from man - is truly adapted to America. In his book The Longhorns, J. Frank Dobie states this situation well: "Had they been registered and regulated, restrained and provided for by man, they would not have been what they were." Hardy, aggressive, and adaptable, the Texas Longhorns were well suited to the rigors of life on the ranges of the southwestern United States. They survived as a primitive animal on the most primitive of ranges and became the foundation stock of that region's great cattle industry. With the destruction of the buffalo following the Civil War, the Longhorns were rushed in to occupy the Great Plains, a vast empire of grass vacated by the buffalo. Cattlemen brought their breeding herds north to run on the rich grazing lands of western Nebraska, Wyoming, the Dakotas, and Montana. Thus, the Great Plains became stocked largely with these "bovine citizens" from the Southwest. And, the Texas Longhorns adapted well to their expanding world. They had reached their historical heyday, dominating the beef scene of North America like no other cattle breed has done since. However, the romantic Longhorn era came to an end when their range was fenced in and plowed under and imported cattle with quick maturing characteristics were brought in to "improve" beef qualities. Intensive crossbreeding had nearly erased the true typical Longhorn by 1900. Fortunately, beginning in 1927, the Texas Longhorn was preserved by the United States Government on wildlife refuges in Oklahoma and Nebraska. Also, a few southwestern cattlemen, convinced of the Longhorn's value as a genetic link and concerned for their preservation, maintained small herds through the years. The Texas Longhorn has been perpetuated further by members of the Texas Longhorn Breeders Association of America, which was formed in 1964. Thus, the Texas Longhorn was rescued from extinction. It was unfortunate for today's beef industry, however, that most of the continuing interest in the Texas Longhorn was in its historic and academic aspects. The Longhorn's genetic prospects and economic potential were almost completely overlooked for many years. After seven years of closely observing and studying Texas Longhorns, I am convinced that these cattle may prove to be a real genetic goldmine. Preserving the Texas Longhorn has maintained a substantial amount of unique biological variation which was accumulated over some 400 years in these nature-made cattle. This genetic goldmine provides insurance against genetic erosion that stems from genetic uniformity in our modern cattle breeds. Such genetic erosion could make it almost impossible for cattlemen of today and tomorrow to meet emerging new needs. 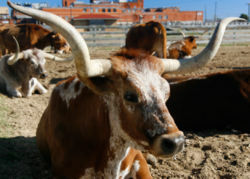 The reservoir of unique genes of the Texas Longhorn can provide some of the genetic variation and flexibility needed to meet the emerging and future needs of the beef industry. At the same time, the Texas Longhorn maintains genetic diversity capable of maximizing hybrid vigor for man's current needs. Thus, the reservoir of genetic material in the Texas Longhorn represents a valuable natural resource. This genetic reservoir grows more valuable as our rapidly-changing economy forces new needs, handicaps, and demands on our cattle industry. It becomes increasingly valuable as our human population bites off increasing amounts of our more productive land, as our grain supply moves into international trade, and as farm and ranch labor becomes less available. This is why the Texas Longhorn is rapidly becoming "the old breed with the new future." By utilizing the Texas Longhorn's unique genetic potential, several of the physical and economic problems confronting the rancher and feeder can be solved or greatly eased. This genetic potential includes genes for high fertility, easy calving, disease and parasite resistance, hardiness, longevity, and the ability to utilize the browse and coarse forage material on marginal rangelands more efficiently than most other cattle breeds. Under the harsh environmental conditions of many areas of North America, the existence of these traits, which have been strongly fixed by nature's culling in the Texas Longhorn, spell the difference between a comfortable profit and the cattle enterprise becoming a "story written in red ink!" High fertility is the most important economic trait in the beef industry. Without a live calf with which to work, all other traits are purely academic! Unfortunately, many of the European breeds of beef cattle are not noted for high fertility, and several are plagued with real difficulties at calving. During a long period of survival of the fittest, however, a Texas Longhorn strain evolved which virtually assures that every healthy cow will present a new addition to the herd each year. This extremely high fertility, which is built into the Longhorn, could perhaps boost the low calf crop percentage found in many beef herds.